This whole month, all I have wanted to do was write the kind of blog posts that I have been writing since I started this blog in November 2011. But I had this opportunity to do some mega research on some toys and electronic things that required tons of work from the testers and their families and so I've been a little busy. Still, I just had to stop to take a quick break to share at least one of my super duper all time favorites this year! Out of nowhere, I met this group and they had a game that really changed the way I feel about iPads and even about how I will buy iPad accessories in the future. I have always had a love/hate relationship with our iPads but playing with OSMO renewed my faith that tablets and children can still be a healthy combination. OSMO uses "reflective artificial intelligence" which basically means that it uses a mirror to let both you and your iPad see what you are doing right in front of it. The mirror is an ordinary mirror (safely embedded) but the software is what makes the magic. So, if you are playing a game, like Newton, balls fall down, you draw a line with a dry erase marker and the balls then bounce of a line and then hit your target. It goes on and on and gets harder and harder like a logic puzzle. It is the most visually arresting of the three games. I love it. Another game, asks you to name a word that you see in a picture but there are just four letters in this word and you are looking at a picture of lovely forest covered in rich tones of red, yellow, and orange. Is is L-E-A-F or T-R-E-E or F-A-L-L? 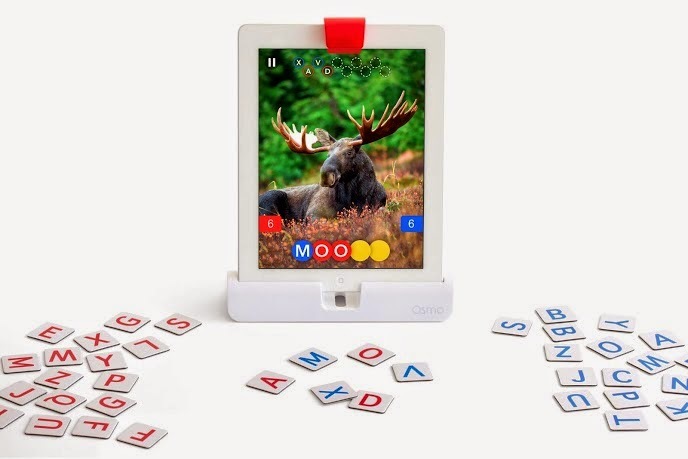 Throw in the letter tiles and OSMO will tell you if you are right or wrong.The sounds are beautiful. Why would a game like this be fun for a kid? It's not really a spelling game totally either and kids are doing spelling tests in elementary school. Correct, it's not just spelling. It's a language game. For example, I can not say "ground" when I mean "floor." So when I'm outside, I might tell my kids, "Don't sit on the floor!" That is a permanent kink in my brain but guess what? This kink demonstrates something that affects so many children and adults. Poorly organizing your words in your mind prevents you from accessing them quickly when you need it. That is why a thesaurus is my friend. So think about those people who are quick with the verbal comebacks. Yup, they have well-greased word file cabinets in well-defined categories in their brains. Games like OSMO's Words is all about word categories but also word associations and making associations is a huge part of being creative. This is why a certain dyslexic child tester I know does well at this game. How cool is it to have a word game that highlights a dyslexic child's language strengths? 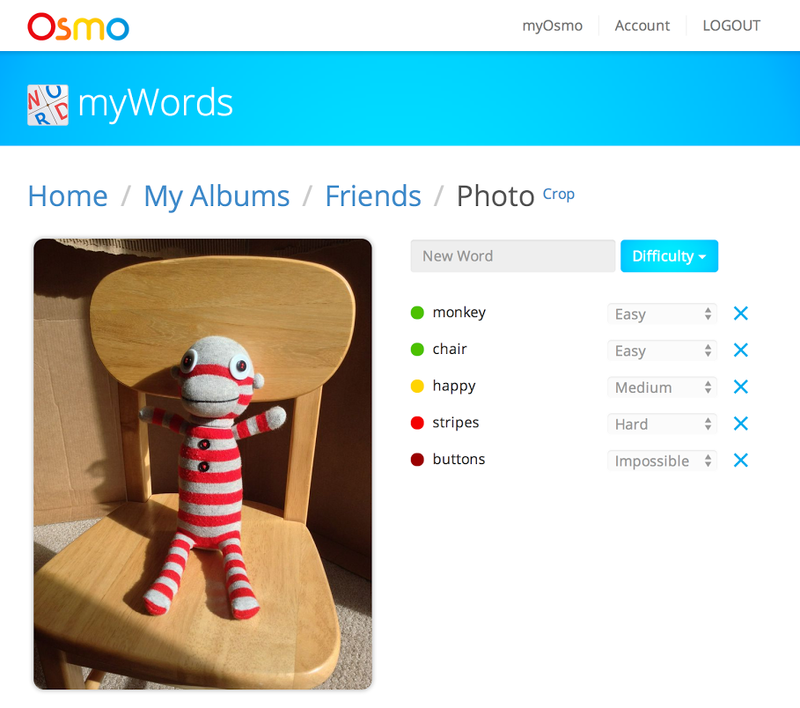 Oh, and did I mention, you can make your Word games on OSMO. Time to get creative! I actually put my own game up today and it's waiting for approval.I hope it'll be approved soon, and you get to see it. My game is called "Exceptional Play" so I am a game designer now. Woo Hoo! Yup,you can make your own game with your own pictures. I hope my game gets approved and I hope you get to play it! Maybe your child doesn't need this feedback and that is fine, you can move onto different levels but the point is: more people get to play. If this blog is about anything, it is about accessibility! If I own an OSMO and I bring it somewhere, you can bet, EVERYBODY wants to know what it is-- I think people are a little scared even. Think for a second... how would the iPad ever know what you are doing when you are not even touching it? At first, it might give you the creeps but seriously, how can you not be curious and want to be part of the magic? I told my twenty-something friend about OSMO, no children, a gamer, and he bought into the crowdfunding campaign in minutes. 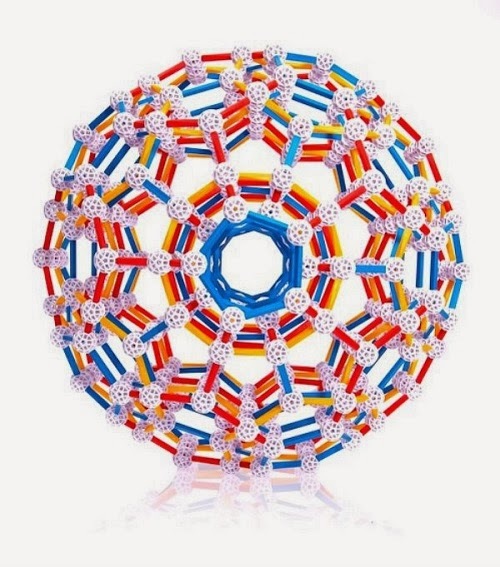 That is what good toys do, you don't think about what is missing, you think about what can be done. It's really the same question and yet if your toy truly impacts you, your question will be the positive one. For the record, experts in education think so too. 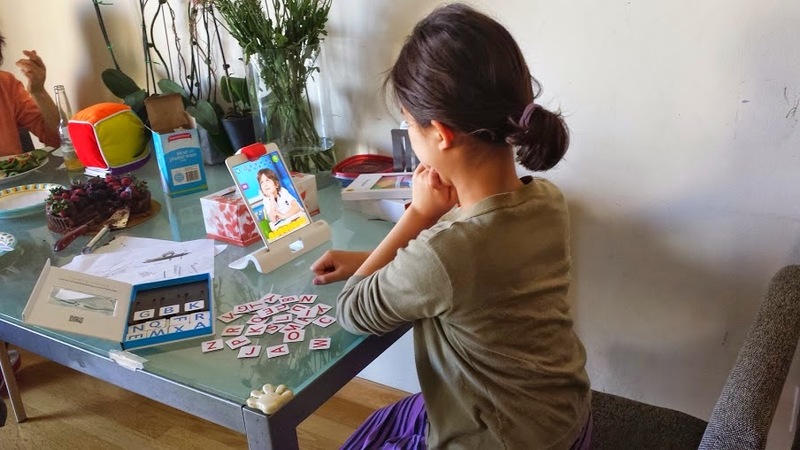 “The interactive nature in general is what I like about Tangible Play,” said Dr. John Ferrera, of OSMO which had been originally called Tangible Play. Dr. Ferrera, a neuropsychologist whose testing and therapy services help children maximize their learning potential was kind enough to join me at the Toy Fair this year and his visit to their booth was so great, it made him late for his appointment but at least he was able to make plans to test out the games. Tester #2, getting VIP demo from CEO and Co-Founder. Damn, is this boy lucky or what? But Jenn, will it last? You've had OSMO for almost a whole year. Everyone always wants to know about longevity. Will it get played with? For how long? Is it a one-hit wonder? First, I will give you the annoying answer of "it really depends on your family." Secondly, I will tell you about how we experienced it and hope it helps you. My kids play OSMO only sometimes. They do not play once a week. Rather, they will play with it a lot for short bursts and then leave it alone for a while. It could be as long as two months. I don't blame Minecraft totally but it really does make things harder. Does this mean that OSMO is not worth $80? 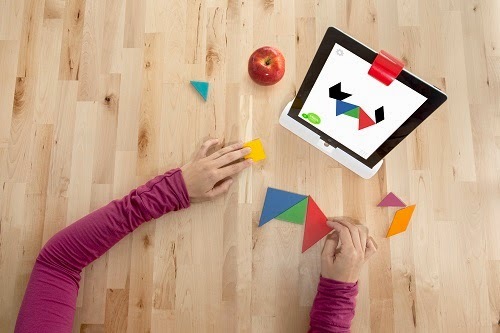 Honestly, I have to say that unless they were creating puzzles for OSMO, I wouldn't want my kids to play with it everyday. I am not sure if I'd want them to play with anything everyday. 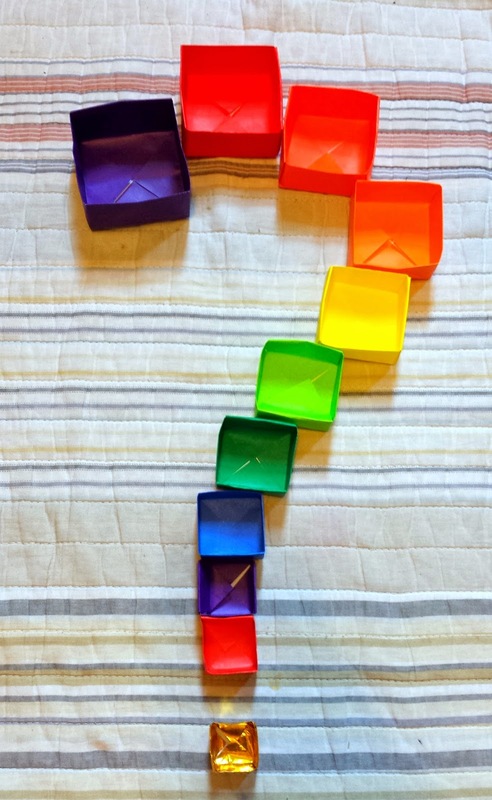 But for OSMO, I don't think there are enough games for everyday play but certainly, in that first 1-2 months, I think they'd be thrilled depending how far they can go with it. But seriously, I find it hard to quantify the value of something like OSMO by the number of hours it has been played. We're not talking about miles per gallon here. I like to think about its value by way it makes you feel about yourself after you play it. Next time you watch your kid play an addictive video game, look at him when he's done. Does he look starved or fulfilled? After my kids play with OSMO, they look pretty darn happy with themselves. I like to think about all the neural pathways that were made during play. I like to think about how easily I can get them to play as long as I play with them or have them play next to me. I like to wonder about what they remember when they see the box in the living room. I'll never know but what can I do, I'm a parent. Like parenting, I think play value can't be easily measured either. It's based on circumstances and the user too. If anything, the value of a good toy, is our perception of it, how they feed us emotionally, the potential futures we have with it. We also have to think about how much we, as parents contribute to "tablet abuse." 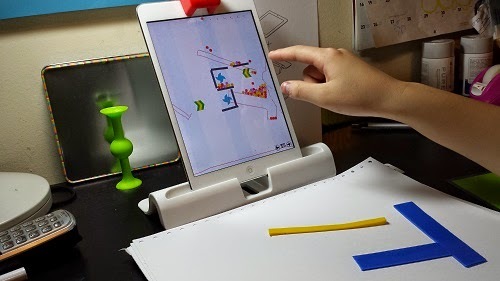 If you are expecting OSMO to defeat those snappy trappy addictive tablet games, I think you'll be disappointed. But know this, because it has made us so happy and I dream of a continuing future with it, I proudly admit, that it's not a sure thing, it is an investment. 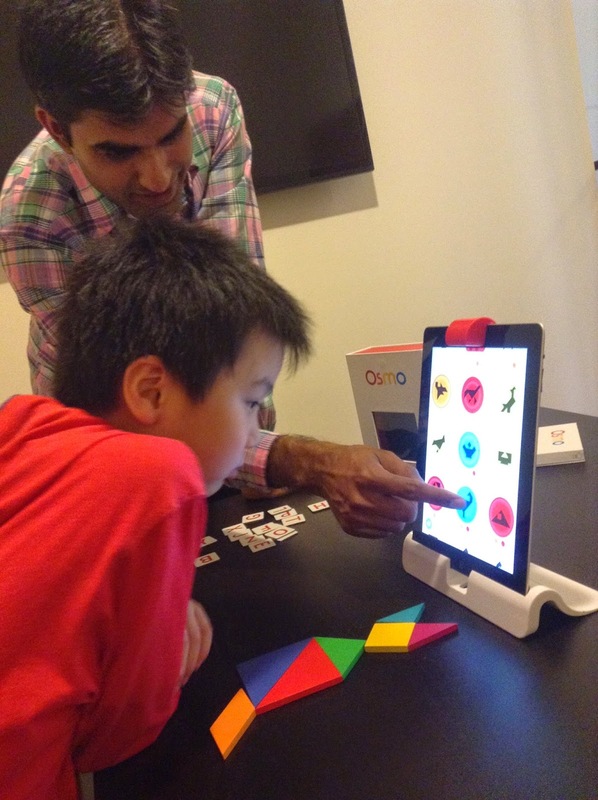 Buying something like OSMO is an investment in my family, my children, and myself. That's worth $80 to me, easy. Happy Holidays Everyone. 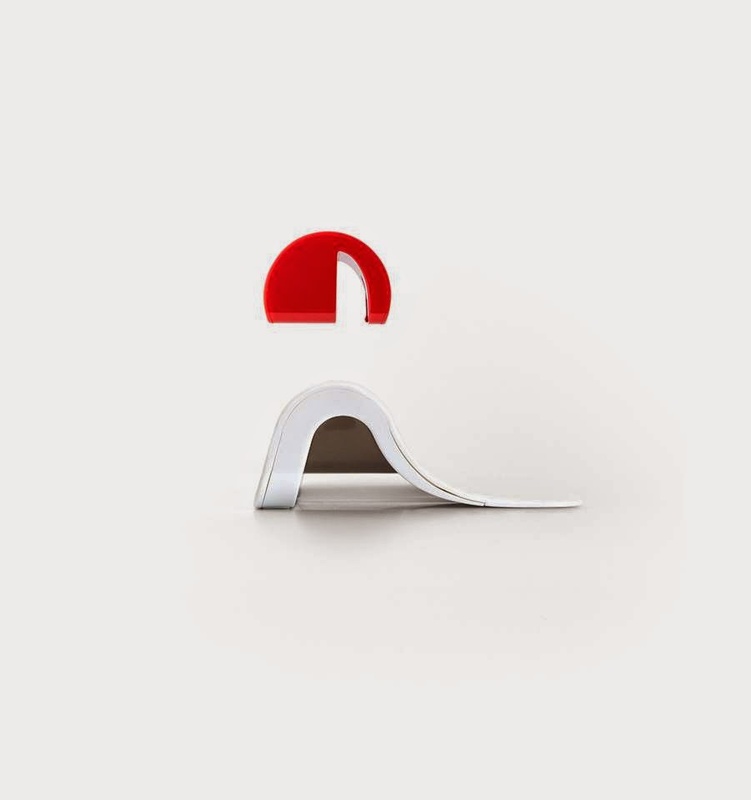 OSMO is sending one lucky winner their very own OSMO. Use Rafflecopter to enter. The winner will be notified on Monday so you only have three days to social mediatize this one but if you don't get an email from me by Monday, don't wait and claim your OSMO. If you choose to give it to your kids after Xmas, you'll get $15 off. I just read that on their site. US only giveaway. ENDS THIS SUNDAY at midnight. Just three days! Yesterday I couldn't get my comments to post here; let's hope today is better. My problem with kids using tablets in education: I am not proficient with them! Our district will only use free apps, or buys ones that are too worky for kids. 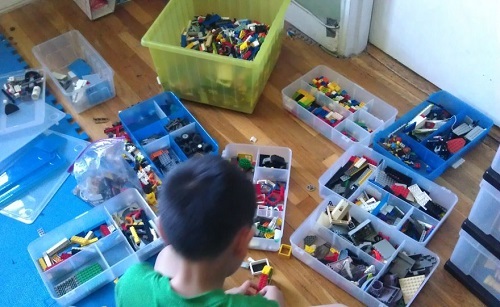 I rely on experts outside the realm of public ed (like Toys Are Tools!) to keep me in the know; there aren't enough people like you, Jenn! I'm trying, but really feel limited knowledge-wise at this stage. Right now I have a parent who is researching iPads and apps for me as her son has very specific needs and I just wrangled a mini for him to use. This blog was very helpful. 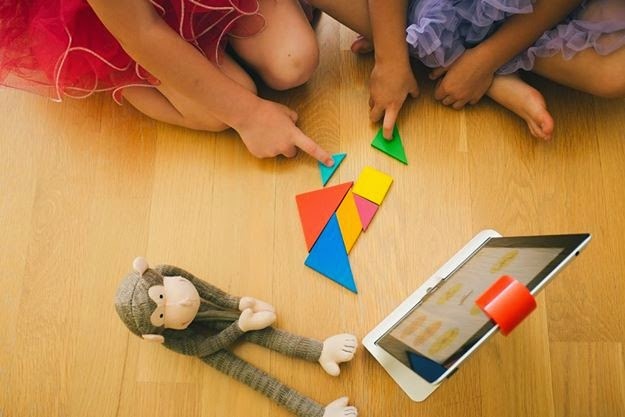 When OSMO popped up on fb, I didn't bother to read much and dismissed it as not challenging or educational. 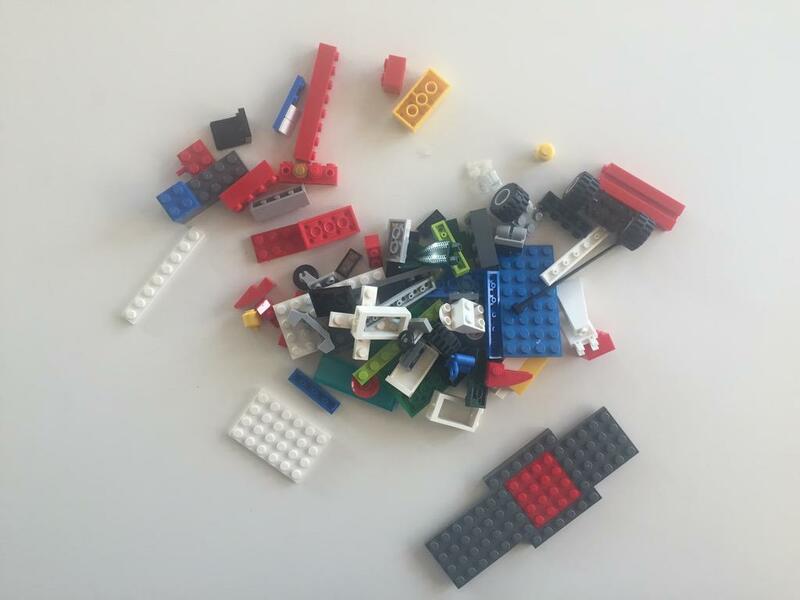 I'm totally convinced now that my students need this for problem solving, multi-dimensional thinking, focus, and executive functional planning. I might have made that last phrase up, but mean they need to be able to differentiate left/right up/down while performing a task that demands planning ahead. I believe many kids with dyslexia/learning disabilities in my case load struggle with exactly that. My boss is letting me get some iPads, this would be funtastic to win! I teach at a high school and tablets can be used to their potential only with well trained faculty and closely supervised students. They should be part of an inclusive approach to instruction, where all platforms are used - written, instructional technology, visual, auditory and kinetic. I would love to win one for my 7 year old grandson! I think it depends on the school district and the resources available. Also it depends on how far outside the box educators was to go. At my son's school his social worker got tablets with Minecraft and started a weekly club. This has helped my son who struggles with unstructured recess and helped him socially make friends with a shared interest. At home we use games like Scribblenauts to help the kids learn spelling. 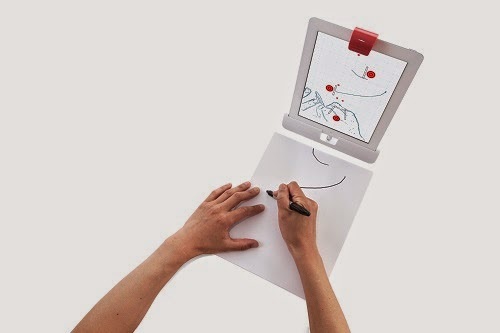 I wonder if OSMO can be used to help older kids refine their drawing skills. I know my oldest has been working on more realistic drawings and sketches. It seems there is a possibility there. Great list! Lots of toys we already love and new ones we will have to check out.